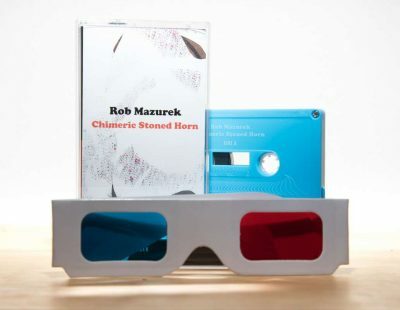 Monofonus Press | Rob Mazurek “Chimeric Stoned Horn” CD/CS Out Now! Rob Mazurek “Chimeric Stoned Horn” CD/CS Out Now! So happy to present the latest and greatest from Rob Mazurek! Chimeric Stoned Horn is the culmination of extensive & explorative musical and visual work from Mazurek. Chimeric Stoned Horn represents both Mazurek’s first recordings playing the Piccolo Trumpet alongside his growing electronics setup, as well as being part of a larger audio visual work, Constellation Scores which is currently showing at URLDA in Lyon, France. 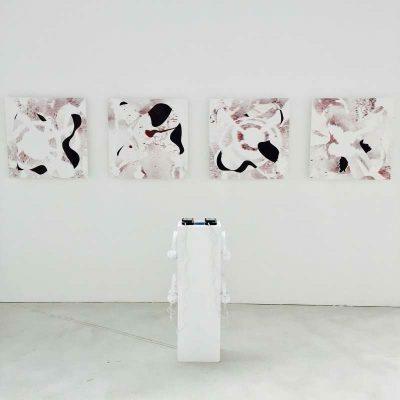 Mazurek created the four “Chimeric Stoned Horn” 3D lithographs (you can see in the photo below) as a part of the Constellation Scores show, and they also serve as the covers for both the cassette & CD versions of the album. Also worth mentioning is the Chimeric Stoned Horn cassette is a direct musical part of this exhibit as well. There are cassette players & headphones set up (again see photo below) so you can view and listen in symmetry! Beautiful reviews are starting to roll in for Chimeric Stoned Horn from All About Jazz, Hi-Bias and many more. Also we would like to mention that this is also our first CD release here at Astral Spirits. A lovely wallet style CD that features 2 of the Chimeric Stoned Horn lithographs on the front and back cover. 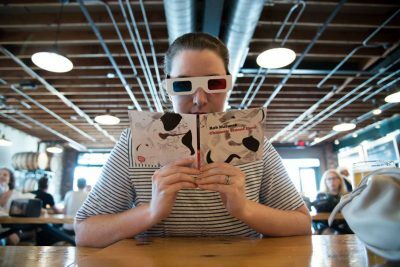 The cassette version features a third lithograph AND both CD & CS versions come with a pair of 3D glasses for your viewing pleasure. Even if you can’t make it to France you can still enjoy the audio & visual beauty created by Mazurek. Go here to order from our store now!